Written specifically for RN to BSN and second-degree nursing programs, the book is the only such text grounded in nurses own understanding and experience. Concise and practical, it supports foundational concepts with real-life case studies and clinical applications and reinforces information with interactive quizzes and multimedia materials. The books content fulfills one of the AACNs key Essentials of Baccalaureate Education. 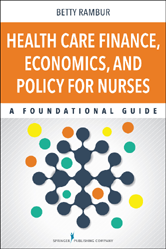 Written by a health economics and policy expert, former dean, and award-winning teacher, the text synthesizes the vast scope of health economics to create an easily understandable guide for nursing action from bedside to boardroom. 1. What Is Health Economics and Why Is It Important to Nurses? What Does It Mean to Bear the Consequences of Financial Decision Making? Is Consolidation the Same as Integration? Can Economics Coexist With the Intention of “Doing Good”? Tell Me One More Time: What Does All This Financing, Economics, and Policy Have to Do With Nursing?